Last night Thomas Ganter won the £30,000 BP Portrait Award 2014 at the National Portrait Gallery in London - and below is a film of the awards ceremony. I filmed the presentation ceremony with Mini iPad in one hand and my camera in the other taking photographs - hence there's an odd wobble in this video and less than wonderful framing at times. If you want to skip the Havers speech, the awards ceremony actually starts at 2 minutes 30 seconds. 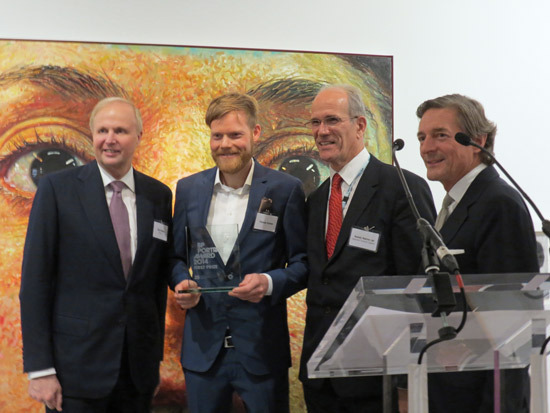 Nigel Havers, the actor presented the BP Portrait Award prizes to the prizewinners - assisted by Bob Dudley, the BP CEO and Sandy Nairne, the Director of National Portrait Gallery. This Awards Ceremony was special for two reasons. It marked the 25th anniversary of BP's sponsorship of this Award. This was also the last Awards Ceremony to be hosted by Sandy Nairne. Last week he announced his intention to retire from his post as Director - although he won't be going until early 2015. he's been the Director since 2002. I'll be writing a number of posts for this blog this week, following interviews with the prizewinners and a proper tour of the exhibition. I've been covering the BP Portrait Award for some years and have an extensive archive of posts relating to previous competitions which I know are much studied by those contemplating an entry! BP Portrait Award 2013: Call for Entries The competition is open to all artists living anywhere in the world who are aged 18 and over on 1st January 2013. BP Portrait Award 2013 - Selected Artists and Statistics - list of selected portraits / exhibiting artists for the 2012 Exhibition at the National Portrait Gallery. BP Portrait Award 2013 - The Shortlist - identifies those shortlisted. See if you can guess which work won before reading my review post. Carl Randall's Japan - the best BP Travel Award Exhibition ever! BP Portrait Award 2011 Shortlist - identifies shortlisted entries and artists. See if you can guess which work won before reading my review post. Thanks to you I knew exactly where to go to read all about this today - your reporting and posts on the blog and Facebook are so appreciated Katherine. I love starting my day with a great big art fix and the BP Portraits are so exciting this year. So thanks for this and all your hard work. Hope you had a great night. (How could you not?) All the best. Thanks for the video Katherine. I've always wanted to be there for the ceremony!! Who made a mark in May 2014?